MANSFIELD, Mass. – The Hornets won the coin toss and elected to defer possession to the second half. With senior Diogo DeSousa kicking with the wind at his back, Mansfield coach Mike Redding knew that he could pin the Bombardiers deep in their own zone. The strategy worked perfectly. 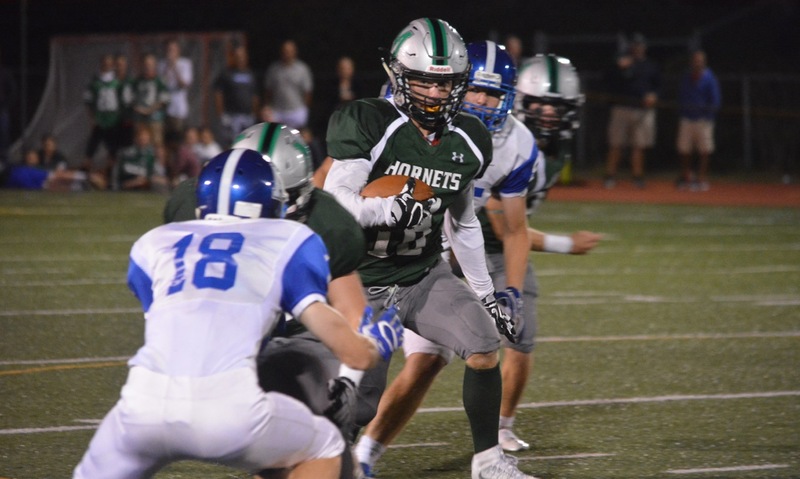 Mansfield started all but two first half possessions in Attleboro territory and the two that started in the Hornets’ half of the field were at the 49 and the 48. 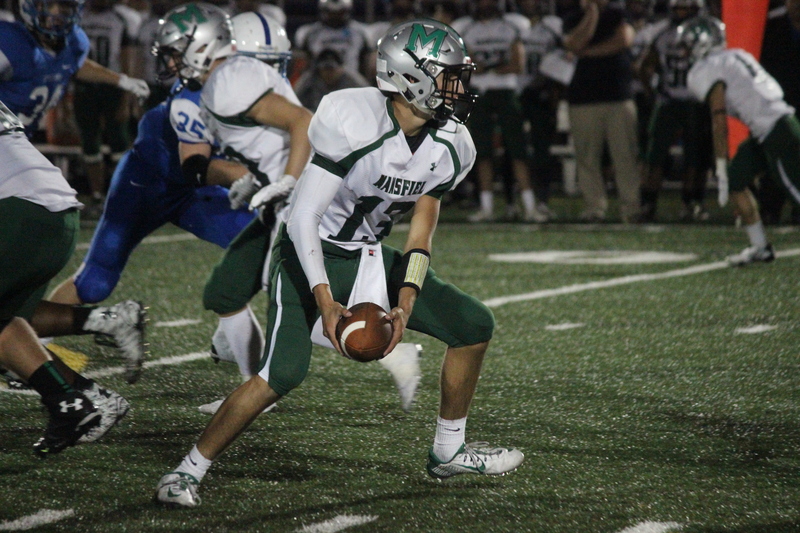 Mansfield cashed in every time, scoring each of the first five times it touched the ball and cruised to a comprehensive 38-7 victory at Alumni Field in the league opener for both teams. After a three and out to start the game, Mansfield started its first possession at the Attleboro 40. Kristian Conner rushed for 15 yards to the left, Nick Graham went for 11 up the middle, and Will Garvin broke a 15-yard carry on a counter. Joe Cox capped the short drive with a one-yard plunge to put the Hornets on top. Attleboro got off to a good start on its next possession with Tyler McGovern (7-16, 61 yards) hit James Weir down the seam for 21 yards. But on the next play, Cam Furtado had the ball ripped loose by Julio Arevalo who kept hold of it and returned the fumble 34 yards to the one. Anthony DeGirolamo scored on a QB sneak on the next play and it was 14-0. Another three and out gave the Hornets the ball at their own 49. Four plays later, on fourth and three from the Attleboro 44, Graham took a toss sweep to the left and cut it back inside, finding a hole and taking it to the house for a 21-0, first quarter lead. The mistakes continued for the Bombardiers with the next possession ending on a low snap that flew past McGovern and was recovered by Jareme Dilorenzo at the six. Two plays later, DeGirolamo hit Hunter Ferreira on the near sideline for a four-yard score. Ben Budwey returned an Attleboro punt 12 yards to the Bombardiers 27 where Mansfield started its fifth possession. Again the Hornets took advantage of the short field. Cox had two carries for 20 yards and Graham ended the drive with a seven-yard carry up the middle for his second touchdown of the game. Redding credited the play of the offensive and defensive lines for the dominating performance. He also mentioned the play of Will Shield and Jayson Richwine on the line and Mike Shannon at tight end for creating the space for the playmakers. The Bombardiers tried to get back into the game in the second half. McGovern hit Weir again down the seam for 21 yards to the Mansfield 19. After a six-yard gain by Marc Dieu, McGovern hit Elvin Sam for a 13-yard touchdown. The ensuing kick bounced in front of the Hornets’ returner and was recovered by Malik Mcalister-Pruitt. The comeback ended on a turnover on downs at the Mansfield 19. “They’re a good football team and they’re better than us,” said Strachan. “I think it’s that simple. In every aspect of the game, they came to play and they caught us early. DeSousa tacked on a 33-yard field goal in the fourth quarter to round out the scoring. Mansfield will head into next week’s showdown with King Philip clicking in all four phases and Redding was already thinking ahead to next Friday. “We’ve got another huge one next week,” he said. “It won’t determine the league title but whoever wins is certainly in the driver’s seat moving forward. With North leaving the division, it’s kind of us and KP taking over as maybe one of the better rivalries. Mansfield football (2-1) will host King Philip (3-0), which beat Oliver Ames 42-6 on Friday, at Alumni Field next week. Attleboro (1-2) will look to end a two-game losing streak when it hosts Taunton (1-2). TAUNTON, Mass. – Despite being limited to just two hits over the first five innings, a single and stolen base paired with a key Taunton error allowed Mansfield to break a scoreless tie in the sixth and slip past the Tigers, 2-0. With one out in the top of the sixth inning, Mansfield left fielder Zack Peterson grounded one through the hole on the left side for only the third Hornet hit of the game. After Peterson advanced to second on a ball in the dirt, Max Boen hit a grounder to short, and attempting to nab the lead runner at third, a throw from the Taunton defense went out of play, allowing Peterson to cross the plate with the eventual winning run. Mansfield added an insurance run in the seventh inning as designated hitter Colin Gibbons was hit with a pitch, moved to second on a sacrifice bunt by Aidan Cahill, to third on a single by Charlie DeMassi, and home on another Peterson grounder that found a hole in the Taunton defense. DeMassi took off on the pitch, forcing Taunton second baseman Kevin Griffin to cover the bag and leaving the right side vacated for Peterson to drive one through into right field and bring home the run. Hornet senior starting pitcher Jack Neureuter kept the Tiger offense off the board over six innings of work, scattering six hits while striking out five and walking only two, one intentionally. Taunton did have opportunities to take the lead early in the game, but Neureuter’s pitching combined with stellar defense behind him ended multiple Tiger threats. In the second inning, Taunton first baseman Charles Hearrold III doubled to right center field with one out. Right fielder Dan Noonan then lined one to left center, but DeMassi made a diving catch moving to his right, gained his footing, and fired into second base for an inning-ending double play. An inning later, with Griffin on second base, Cahill, the Mansfield third baseman, went to the backhand to stab a hard Luke Figueira groundball and throw him out at first. Taunton later had the bases loaded with one out in the fifth inning, and after Neureuter induced a strikeout, Figueira laced one to center field, but DeMassi was there again to make a sprawling grab and end the inning. Taunton left eight runners on base in the game. Though he was charged with the loss, Figueira pitched the complete game for Taunton, allowing six hits while striking out three. He allowed just two runs, one unearned, and stranded runners on the corners in both the sixth and seventh innings to give his team a chance. Taunton also missed a chance to claim a share of the Kelley-Rex Division title and will now await the result of King Philip and Stoughton on Saturday. If KP wins, the Warriors win the division outright, but if Stoughton wins, Taunton and KP will share the title. Mansfield baseball improves to 8-11 overall, 7-9 in the league and will travel to Bridgewater-Raynham on Wednesday afternoon. Taunton, now 13-5 overall and 11-5 in the league, will play the first of two non-league games to close out the year with a trip to New Bedford on Wednesday evening. NORTH EASTON, Mass. – Heading into the bottom of the seventh inning faced with a three run deficit, it looked like Oliver Ames was headed to its ninth loss of the season. With two outs, not much had changed with the Tigers still trailing 4-1 to the Mansfield Hornets. But on a 2-2 count, OA senior Josh Minuskin belted a three-run home run into left center field, tying the game and it looked like the game was destined to head to extra innings. But a walk, a single and a hit batter later, suddenly Oliver Ames had the bases loaded and a chance to win. Freshman Chris Pearsons blooped one into left field, right in between a charging left fielder and a pair of back pedaling infielders to score the winning run and the Tigers walked off with a 5-4 win at Frothingham Park. The rally started with a one out walk drawn by senior Matt Mancini. After a pop out for the second out, sophomore Matt Muir battled his way to a walk to put two on with two outs. Minuskin got a fast ball on a 2-2 pitch and launched it into left center. Mancini and Muir came around to score easily and after a slight bobble at the cutoff in left, Minuskin was sent home and he was able to beat the throw to tie the game. 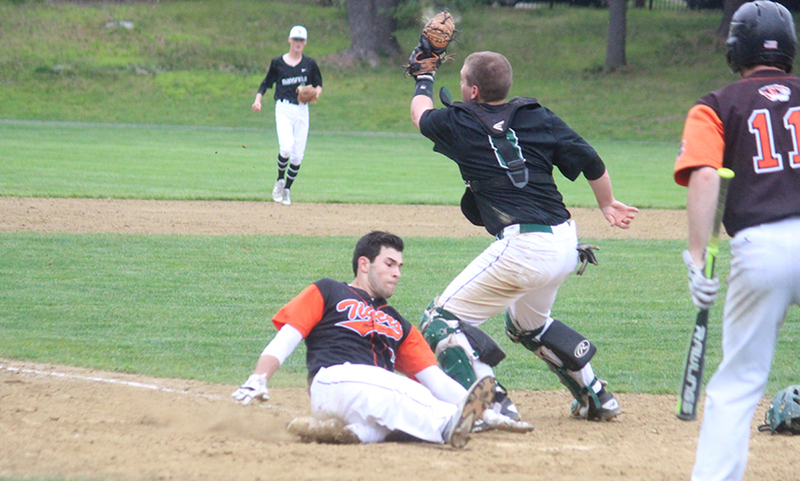 “He’s a senior captain and that was a bomb, easily the furthest hit all day,” Oliver Ames head coach Leo Duggan said. “With the weather today, we didn’t think the ball would go that far. And then coach [Ed] Rollo sent him home because there was an issue at the cutoff so that was a great call right there. The bases didn’t stay clear for long with Ryan Adams drawing a four pitch walk. Kyle Gagliardi followed with an infield single between third and short to put two on with two out. Sophomore Mitch Goulet was hit by a pitch to load the bases for the freshman Pearson. Pearson connected on the second pitch her saw, blooping one into left as Adams scampered home, sending the Tigers into a frenzy. “We were happy we tied it so we had [Zach] Sato, probably our best pitcher, was going to warm up for the eighth,” Duggan admitted. “Then Ryan [Adams] drew a walk, Kyle singled and Mitchell got hit. We were playing for extra innings but all of a sudden they woke up. Chris is only a freshman and he seems to be getting better everyday. That was a big situation and he came through. Mansfield took the lead in the fourth inning and added a run in each of the fifth and seventh innings. However, the feeling was one the Hornets have had before. A leadoff single from Zack Peterson in the top of the fourth got things started for the Hornets. Junior Aidan Cahill followed it up by reaching on a throwing error and senior Mike Arnold loaded the bases with no outs after getting hit with a pitch. Tyrone Pascual grounded into a fielder’s choice, plating Peterson to make it 1-0. Jake Tryder singled in Cahill at the next at bat to double the Hornets’ lead. Mansfield struck again an inning later with freshman Dan Saraceno leading off with a single. A sacrifice bunt from recently called up sophomore Cullin Anastasia pushed Saraceno to second and a ground out from junior Max Boen pushed the runner to third. Peterson came through with a two out base hit up the middle to extend Mansfield’s lead to 3-0. 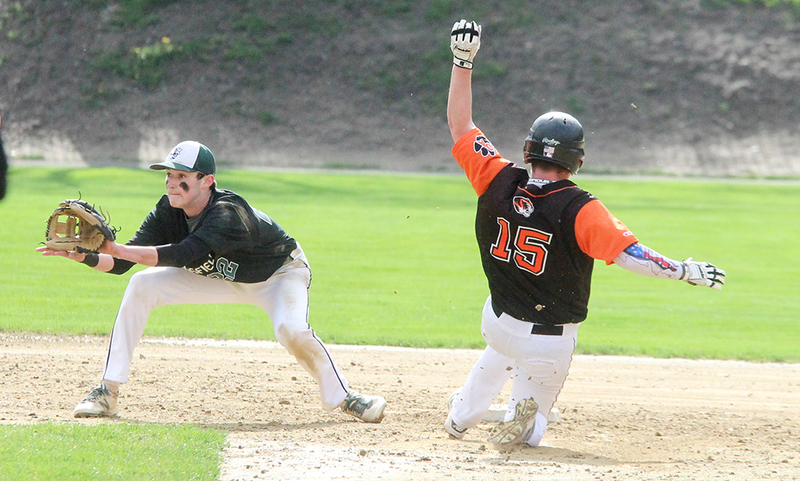 Oliver Ames was able to pull a run back in the bottom half of the inning to cut the deficit to two. Mancini reached on a fielder’s choice and moved to third on a double from senior Chris Romero. Muir then knocked Mancini in with a grounder to second. It looked like the Hornets added an insurance run in the top of the seventh inning, again getting the lead off man on base. Colin Gibbons singled and moved to second on a sac bunt from Saraceno. Max Boen’s sac bunt attempt turned into an error with the throw hitting him as he raced to first, allowing Gibbons to scamper home to make it 4-1. OA’s Michael Mulrean got the win for the Tigers, allowing a run in two innings of work. Muir was the starter, going five innings with two earned runs allowed. 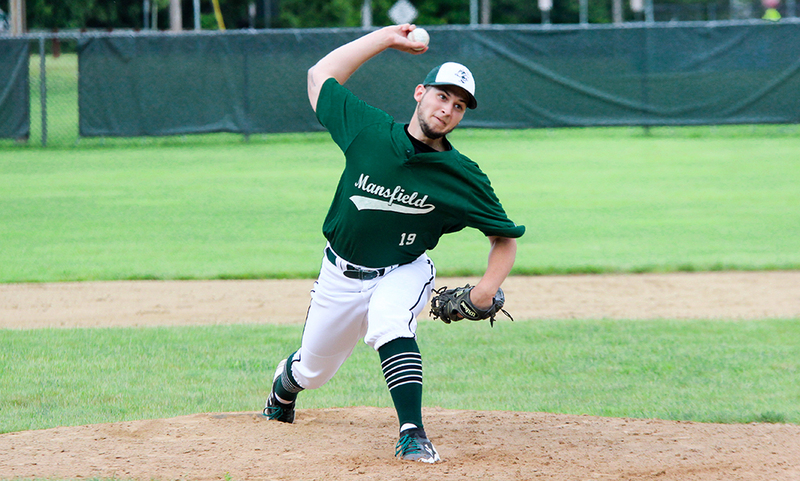 Jack Neureuter pitched a scoreless four innings for Mansfield while Jared Menzer pitched the final three innings. Oliver Ames baseball improves to 6-8 overall and 6-5 in league play, putting them in second place in the Davenport Division. The Tigers will host Sharon on Monday while Mansfield (4-9 league, 5-10 overall) will play host to North Attleboro on the same day.